Mardi Gras is a time to dress up in your masquerade masks and let your alter ego run free. Throw on some of our bulk Mardi Gras beads and let loose this year. If you are hosting the party you will find a huge selection of wholesale Mardi Gras Decorations to choose from. Fat Tuesday is one last day to celebrate before Lent. So let the fanfare begin with the bright and outrageous Mardi Gras Party Supplies and decorations that you will find at Party Express. 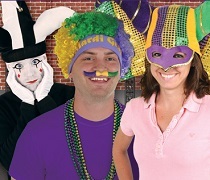 Dress up for the holiday and put on some wild jester hats, bright colored party beads, and feathered Mardi Gras Masks. You outfit will be complete once you are done shopping. 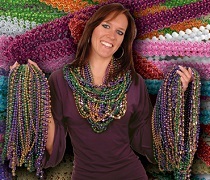 Why not grab a box of bulk beads and toss out over 700 beads onto the streets and into the crowds. If beads are not your style grab a green gold and purple party hat and hit the streets for the festive evening. If you are hosting the Mardi Gras party, then you have come to the right place. 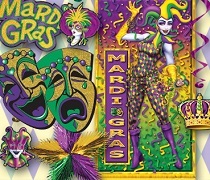 We have a huge selection of green gold and purple Mardi Gras decorations. You will find comedy and tragedy masks that will accent your Fleur Di Lis decorations and musician wall cutouts. It will look like you are marching down Bourbon Street once you get done decorating with the bulk Mardi Gras decorations that you selected from our online store. Only Green, Gold, and Purple will do this Mardi Gras! PartyExpress.com has hundreds of different Mardi Gras Party Favors to choose from this Fat Tuesday. Whether you are looking for Bulk Party Beads to Throw off Balconies or some great Decorations to spice up your space; Party Express is sure to impress with our wide selection for Green, Gold, and Purple Party Favors and Decorations. You can go traditional with Fluer De Lis Decor or colorful with Mardi Gras Jesters. 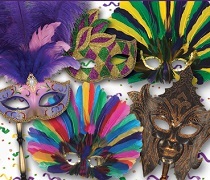 The choice is yours, so be sure to choose PartyExpress.com for all of your Mardi Gras Party Favors and Decorations!